But of course Secret could equally be called “Rumor” – since the posts to secret are completely anonymous, it’s easy enough to share something completely false. In this case Secret is an awful tool that can be used for destructive purposes and shows all that is bad about humanity. 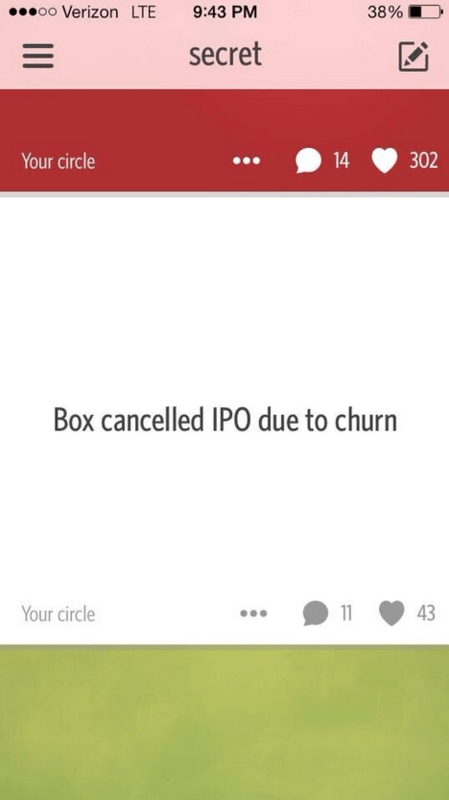 Either way, when I saw the following this evening, my attention was piqued – someone suggested that Box‘s IPO was to be cancelled due to customer churn issues the company is facing. Wow! This is perhaps one of the most hotly anticipated IPOs for the year, alongside that of arch-rival Dropbox. A cancellation of the listing would create seismic waves across Silicon Valley. It would also be a little surprising given some recent statistics about actual revenues derived by some of the big names in the file sharing space – Box was top of the list in that analysis and, while the report didn’t take into account customer churn, it would be a real surprise if that sort of revenue was accompanied by significant churn. Personally I doubt the veracity of the claims, which brings us onto the not insignificant issue of anonymous applications. In this example, no real harm can be done, but it would be all to easy for someone to anonymously impact upon the market capitalization of a company using an app like secret. or, even worse, we’ve seen how anonymity can be used as a cloak for character assassination and identity fraud. How Secret and other applications find a path that sees them balance anonymity with truthfulness is anyone’s guess. Like anonymous comments on blog posts and newspaper articles, Secret has previously been used to great effect, but also to create damage. Maybe humankind just isn’t mature enough to be given the gift of anonymity.